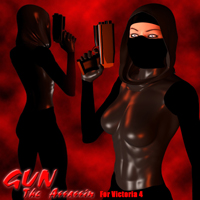 A deadly set of Poses, Props, Textures and Accessories for Victoria 4. Use the gun props and parts to create your own style of weapons. Is she an assassin, a ninja, a vampire hunter or a secret agent? You decide!